The generous among us might call it serendipity, while the rest of us would just call it luck. By whatever name, I had it in spades in June last year when I made my first visit to the Glass Mountains of northwestern Oklahoma. My original plan was to go to Tallgrass Prairie Preserve in eastern Oklahoma at the end of what proved to be a resoundingly successful day at Alabaster Caverns State Park. However, soaking rains moved into the area and continued rumbling eastward across the plains towards the preserve, forcing a quick change of itinerary. I decided to wait it out in the state’s western reaches, a “hunch” telling me that the red clay/gypsum hills in nearby Major County might be a fruitful place for hunting tiger beetles. Sunny skies the next morning were a good sign, and my hunch was rewarded later that day when I discovered a previously unknown (and fortunately robust) population of the rare Cylindera celeripes (swift tiger beetle), making not just the day but the entire trip more successful than I could have ever imagined. Icing on the cake came when I found decent numbers of the more secure but nevertheless uncommon Dromochorus pruinina (frosted dromo tiger beetle) also in the area. Another find I made that day that I’ve mentioned on occasion but not talked about at length was a single, rather large tiger beetle larva. I found several burrows at the base of a talus slope at the edge of a small ravine where many adult C. celeripes were scurrying, and though I tried with many, out of only one did I manage to “fish” its occupant with a blade of grass. I didn’t know which species it represented, but its large size and occurrence in clay soil brought to mind two species – Cicindela pulchra (beautiful tiger beetle) and C. obsoleta (large grassland tiger beetle). Both of these Great Plains species reach their eastern limit of distribution in this part of Oklahoma (Pearson et al. 2006), and their status as the largest species of the genus (and its former subgenera) in North America seemed to make them the leading candidates for this enormous larva. There was one other possibility – Amblycheila cylindriformis (Great Plains giant tiger beetle), another Great Plains species at its eastern limit in western Oklahoma and (as the common name implies) the largest tiger beetle in all of North America. However, to consider that species seemed too much wishful thinking. From my understanding, larvae of that elusive species reach an incredible 45 mm in length and dig burrows on steep slopes or at the mouths of rodent burrows that extend vertically to depths of up to 1.5 m or more (Brust et al. 2005). Surely I could not have so casually stumbled upon such a grand grub! I placed the larva in a terrarium of native soil and brought it back with me, and for one year now I have waited – feeding it a regular diet of the fat noctuid caterpillars that we rear so abundantly in our lab. For a full year, I’ve watched it nab caterpillar after caterpillar, disappearing mysteriously for days on end, and just as mysteriously reappearing at the top of its burrow. I knew getting a closer look at it would help in my attempts to determine its identity, but every time I approached with a camera it dodged down into its burrow and beat my patience. Sometimes I would see it sitting about a centimeter below the burrow entrance – just waiting for a caterpillar to crawl by but refusing to expose itself to the lens. I gradually decided it was likely C. pulchra, as I had seen that species in similar habitat not too far north in Barber County, Kansas. So strong was my suspicion that I even made another trip out to the Glass Mountains in October of last year, expecting to see the fall-active adults bejeweling the exposed flats below the red clay slopes, their wine-red elytra and purple-margined bodies all aglitter under the crisp, autumn sun. No such sight was beheld, however – my hopes dashed by the season’s sudden cold and wet turn, and with the terrarium containing the larva by then tucked away in a cool incubator for a winter’s rest, it would be several months before I would see the larva once again sitting at the top of its burrow. In late March I pulled the terrarium out of the incubator, and within a week the larva reopened its burrow. 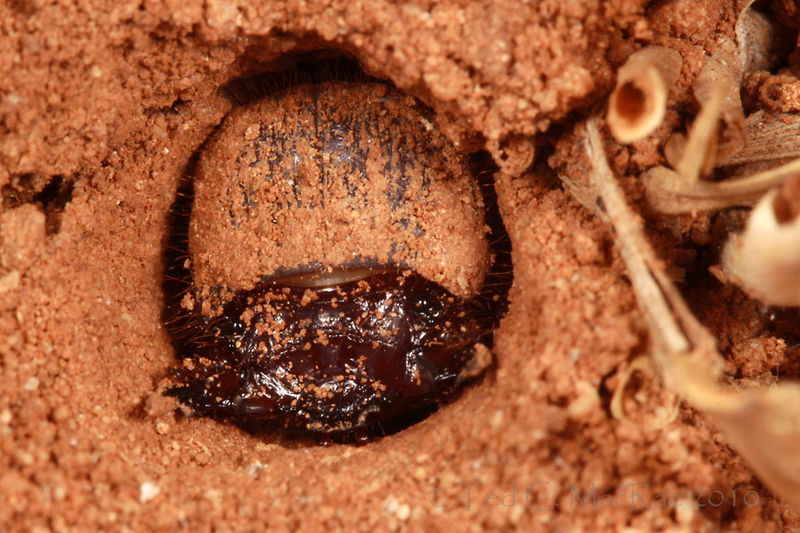 I fed it a few times, and then one day I saw that it had dug a new, larger burrow – measuring a full 10 mm in diameter! This seemed extraordinarily large for any species of Cicindela, so I resolved once again to photograph it and determine its identity. For days I stalked it, keeping the terrarium just outside my office door where I could keep an eye on it, yet every time I approached within two feet or so it would drop down out of sight. I decided to stop feeding it – perhaps hunger would overwhelm its patience and prompt it to return to the top of its burrow more quickly after retreating. That seemed to work, as one day the larva came back up after only a few minutes – and I was ready! Already in position, I flashed off multiple shots as soon as it reappeared, moving slowly and deliberately between shots to avoid spooking it again, and managed to get a nice series from varying distances. As a testament to its enormous size, all of the photos shown here were taken with the standard 100mm macro lens (1X maximum) – not the 65mm 1-5X beast that I needed for these shots of the super-tiny C. celeripes. Thinking that the larva likely represented C. pulchra, I compared the photos to this photo taken by Matt Brust of a 3rd-instar larva of C. pulchra and immediately noted the differently shaped pronotum of my larva and its distinctly projecting anterolateral angles. Compare to C. pulchra, in which the angles are in line with the median part of the anterior margin – it is clearly not that species. It isn’t C. obsoleta either, as that species has the anterolateral angles of the pronotum even less projecting than C. pulchra (Drew and Van Cleave 1962). Apparently I needed to rethink my assumption that it belonged to Cicindela or its close relatives – none that occur in Oklahoma are simply large enough! Tetracha virginica is large enough, but I knew it wasn’t that species since it lacked the white margined pronotum distinctive of species in that genus (as can be seen in this post on the larva of Tetracha florida). That left only A. cylindriformis, distinguishable from all other tiger beetle genera occurring in Oklahoma by the second (lower) pair of eyes distinctly smaller than the first (Hamilton 1925, Drew and Van Cleave 1962, Pearson et al. 2006) – clearly seen in the third photo above. Matt Brust has also photographed the larva of A. cylindriformis – it’s not a close shot of the head and pronotum, but in general aspect my larva seems to match it well enough. All that is left is to actually succeed in rearing this larva to adulthood. These beasts may require up to three to four years to develop (Brust et al. 2005), although this is likely influenced by latitude and prey abundance. I suspect it was a second instar larva when I collected it, and that it dug its new burrow this spring after molting to the third (and final) instar. Hopefully by keeping it in a nice, warm growth chamber and feeding it generously with fat caterpillars, I can minimize the time to pupation and perhaps see the adult sometime later this summer. If/when that happens, you can be sure to see a follow up to this post. Photo Details: Canon 50D (ISO 100, 1/250 sec, f/16-18), Canon 100mm macro lens, Canon MT-24EX flash (1/4 ratio) w/ Sto-Fen diffusers. Post-processing: contrast and unsharp mask (no cropping). This entry was posted in Cicindelidae, Coleoptera and tagged beetles, entomology, Great Plains, immatures, insects, nature, North America's most..., Oklahoma, rearing, science, taxonomy, tiger beetles. Bookmark the permalink. 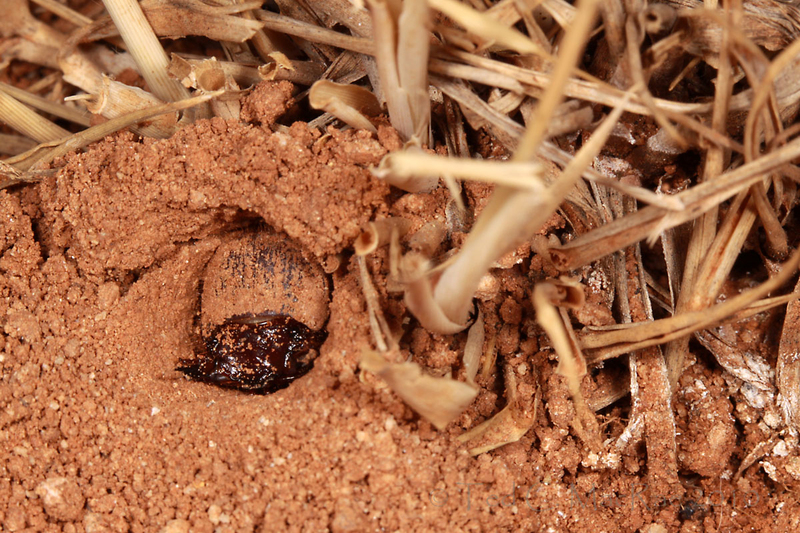 Speaking of tiger beetle larvae, do you have any pointers for distinguishing a tiger beetle burrow for a ground-nesting hymenoptera burrow? I found a burrow in our yard that had some insect inside plugging the hole with its head, which I photographed, but then when I tried digging it up a few hours later, I was able to trace the hole to what I thought was the end (about six inches underground) and the inhabitant seemed to be gone. Later, I found a similar-looking hole, but when I dug this one up, an yellow-and-black-striped hymenoptera of some sort (it looked like a wasp) flew out of it too quickly to catch. I was expecting a larva, and it caught me off guard. Is there a visible difference in the burrow style, or does one just have to go ahead and start digging/fishing to see what comes out? 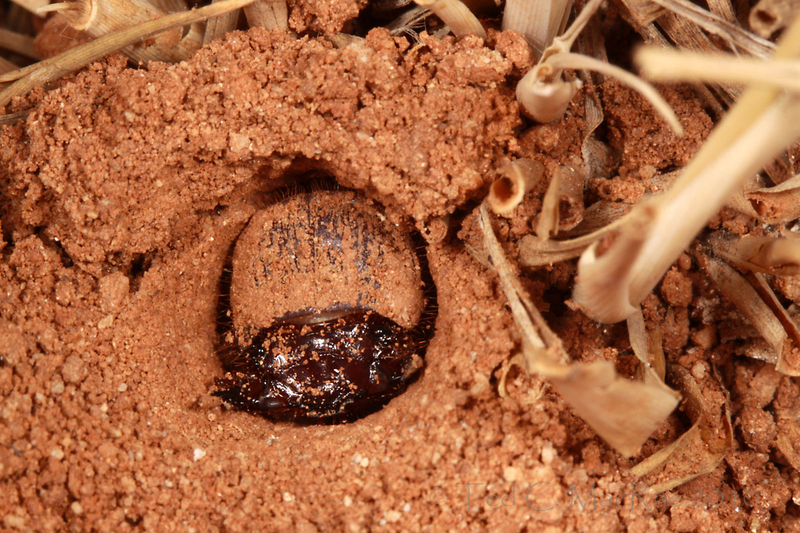 Tiger beetle larval burrows look very similar to those of many ground-nesting bees and wasps, but with practice one can learn to discern between them quite readily. Tiger beetle burrows nearly always have a smoothly beveled edge – it’s subtle but nevertheless quite characteristic. Also, you might be able to discern a very slight “D” shape to the opening, with the flattened side of the opening being where they orient their jaws. Tiger beetle burrows often drop straight down, so you can drop a thin grass stem into it and it will sink anywhere from 6″ to almost 2 feet for many species. They are very hard to dig up because of their depth – the best way to collect the larvae is by “fishing” (follow link in article) or by waiting for them to return to the opening and ambushing them with a trowel jammed into the ground under them to block their retreat. Hymenopteran burrows always seem very round and not quite the “right” size (again, takes practice), and often they seem to angle into the ground or bend underneath rather than going straight down. The whole adventure with the larva sounds very exciting. I hope the emergence of the adult meets or exceeds your expectations. I’ve been scouring the barrens for active Trap Door Spider burrows and have been keeping a watch for tiger beetle larvae. I haven’t yet searched the areas that usually have the most adult tiger beetles, because it’s been raining about every other day and it would make a real mess if I spent too much time in there when it’s wet. Once things dry up, I’ll do some serious searching. I’ve never seen a live tiger beetle larva, but intend to this summer. In your area, I’d look for vertical erosion cuts above 2-tracks or streams. If the larvae are active, they’ll pop down on your approach and you’ll see holes suddenly appearing in the bank. Good luck. Cool! Did you happen to see any adult TB? Thanks, Kurt. Adults (and larvae) of this species are nocturnal, so I would have had to go there after dark and look around with a flashlight. Early June, when I collected this larva, is just on the beginning of the adult activity period, so I may or may not have seen any had I looked. Now, knowing that the species is there, I plan to go out there in the next couple of weeks and look for the adults (or at least try to collect a few more larvae for rearing). Yeah, well I’m hanging off the cliff myself waiting to see what emerges – and I’ve already waited a whole year! Very cool! I love the sense of watching a mystery unfold, especially one where nobody knows the answer ahead of time. I can’t wait to see what you end up with. It’s “funstrating” (fun but frustrating)! Great post as usual, Ted. Have to admit.. it was a bit of a tease! I kept scrolling and scrolling, hoping to see the magnificent beast in it’s adult guise… only to learn that it could be a couple more years! Heh! Sorry about that – I could hardly contain my excitement when I finally figured out it had to be this species. If all goes well, you won’t have to wait two years to see the adult – I’m going back out to the Glass Mountains next weekend to look for them.